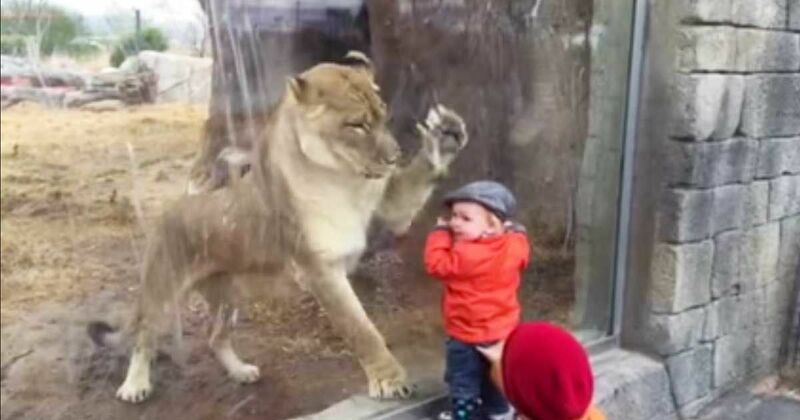 At the El Paso Zoo, a toddler and Zari the lioness share a moment through the glass. This brave little boy approaches the lion enclosure and instantly catches Zari's attention. She swats at him through the glass, even rearing back on her hind legs momentarily. The YouTube video is entitled "El Paso Zoo lion loves children," and it looks like that the feeling is mutual. The little boy seems to enjoy himself as he watches Zari's movements, giggling along with the people around him. According to the El Paso Zoo's website, Zari was born at the Oklahoma City Zoo in 2007 and received her name (which means "Golden") through a contest. Today shares that this beautiful creature is one of the three female lions at the zoo and that she's actually known for "playfully interacting with children." Certainly, it looks like she had fun playing with her new pint-sized pal in the video below. Just to calm down scared viewers, the zoo spokesperson Karla Martinez told Today, "She was just trying to play, and the baby was so close. The baby is safe behind a really thick window, which is made so that visitors can see the animals up close." Of course, the baby is safe because the zoo is a safe space where people can get closer to wild animals without fearing something may happen. It doesn't matter how cute lions are, they're wild animals and, thus, unpredictable. Watch this interaction in the video below, and be sure to share your thoughts with us in the comments section. Would you dare to get that close to a lioness, even with the glass in place?